Yes, Large Professor is right: “Illmatic” has stood the test of time AND Nas is that god on the mic. Nas is nice! Large Professor reflects on God’s Son’s transformation from rugged youth to internationally renowned writer… and how the two aren’t mutually exclusive. Wow. “Illmatic” turns 25 years old on April 19th. When I realized that, at first, I was like, “Damn. I’m old.” But that seminal Nas project is a classic. Therefore, I’m not old… I’m a classic! Now I can enjoy watching Preemo speak on Nas’ classic LP as one of its architects. “Not the one that’s on the album. The one on the album is a remix.” During the making of Illmatic, DJ Premier made one version of “Represent,” then he heard what L.E.S. and Q-Tip did on “Life’s a B*tch” and “One Love” respectively. It sent him right back into the lab. Cantrell, Ezri, and 070 Phi stop the show yet again with the release of the “6 Rings” video from the Starting 5: Vol. 1 compilation. The trio hit the United Center in Chicago to pay homage to — and channel the greatness of — Michael Jordan during the Mass Appeal Starting 5 tour. Word? Sway tryna push up a crew on crew emcee battle in this? Any of these other labels wanna see these hyenas?? Hope so. I’d LOVE to see something like that for the citizens! If you haven’t already RSVP’d (here) for that Starting 5 tour show tonight (in Atlanta)… this ought to do it!! 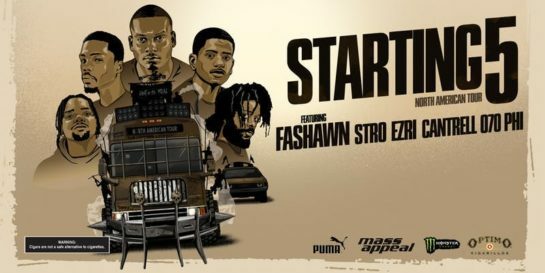 Event: See Starting 5 (Fashawn x Stro x Ezri x Cantrell x 070 Phi) Tomorrow For FREE. RSVP Now! The ‘new blood’ on Mass Appeal’s roster (you know, Nas’ label)… They have been touring the U.S. as the Starting 5, and the tour’s last stop is at Vinyl (Atlanta, Georgia) this Tuesday, March 5th. AND you can see Fashawn, Stro, Ezri, Cantrell, AND 070 Phi for the FREE.99! All you gotta do is follow the link and RSVP. Go. NOW! Sh!t get scary like Freddy, no Fab 5. Riding out to a nice beat, we get more of Cantrell to help bring in 2019 the right way with this one. Following the release of his debut EP Stardust 2 Angels, Cantrell returns with a brand new video for “Fo Five” to kick off the year. Directed by OPN SZN, “Fo Five” begins with a young man that is ostracized by his peers on the basketball court due to his ragged appearance. After a chance encounter, the Albany-native finds himself providing a helping hand and some much-needed guidance. The video is reflective of a culture dominated by material possessions rather than the person who sports them. Hmmm… Some weird elements to start. But when you hear Joji yell, “Game over!” you somehow know it’s all gonna turn out alright… for the most part. “This sh*t goes hard, right?” Joji stepped into NYC’s Good Records with one goal, select three records at random and create a beat on the spot, adding his name to the long list of producers to have taken the #RhythmRoulette challenge. Equipped with The Moody Blues’ ‘Seventh Sojourn’ and two other albums from deep in the crates, the 88Rising artist and producer got really weird using Jimmy Castor Bunch’s “The Last Olé” to create a trumpet-driven beat that is certainly one-of-a-kind. Peep the video above and let us know how he did. You know how this goes: Sango puts on the blindfold, picks three disks and ‘tries’ to make some musical magic happen. So…okay, he ain’t really ‘trying’ because Sango is a Jedi at this. There is no try… only do! After selecting three albums at random from Seattle’s Holy Cow Records, the versatile producer enters the lab and crafted two beats just for us. Chopping up the soundtrack to Richard Pryor’s ‘Blue Collar,’ and even creating hi-hats from vocals on Countess Cathleen, Sango makes it look easy. Got a couple of ‘cheat codes’ for this round of the game, but we’ll let it pass because the finished product bangs! Knowledge and health. True wealth. On this ep of ‘Juice Appeal’ they speak on things like that with “Beloved” bredren Dave East. This week on Juice Appeal, it’s the ‘BELOVED’ duo! New York rappers extraordinaire Dave East and Styles P head to Bed-Stuy, Brooklyn to sit down at P’s juice shop with the honorable Adjua Styles for a casual convo on the heels of the release of Dave & Styles’ well-regarded joint album, ‘Beloved,’ the first dual effort between the two. Expect nothing but gems as they discuss their eating habits, the general direction the “game” is heading in & much more. Producing. The somewhat lost art that Swizz Beatz, born Kasseem Dean, has specialized in since he was 20 years old dishing beats to Jay-Z and DMX. It isn’t just about pairing drums with snares or dancing in the back of the videos. It’s a curation process that’s earned the Yonkers native millions of dollars, more plaques than he can count on two hands, and a reputation that stretches across the seven seas. Hawthorne’s of blue-eyed soul vibes and Jake One’s hit-laden list of production creds are brought to bear on the blindfolded beat-making challenge. Jake One and Mayer Hawthorne form like Voltron to become production duo Tuxedo, the latest contestants on MASS APPEAL’s Rhythm Roulette. The pair stopped by Good Records – the shop, not the label – on East 5th Street in NYC, tied bandanas over their eyes, and grabbed up three random records to sample. Just saying. Rhythm Roulette is a blindfolded record pick type of thing. Seems a bit much to claim cred for the selection. But what Supah Mario did with them joints though… give him ALL respect for that. Dope! “I think I really did my thing picking these records dawg,” says Columbia, South Carolina producer DeMario Priester, aka Supah Mario, who recently pulled up to NYC’s Good Records and took the Rhythm Roulette challenge. Digging through the crates blindfolded, the producer behind hits like Young Thug’s “Wyclef Jean” and “Ice Melts” a standout track off Drake’s ‘More Life’ stumbled onto some heat from James Taylor, GangStarr, and some old-school dancehall courtesy of the Dillinger vs. Trinity ‘Clash’ LP. “I told y’all this was gonna be some Jamaican vibes!” he exclaimed after the needle drop. But he ended up skipping the reggae together and finding some ill breaks on the James Taylor and the Original Flying Machine disc, adding some of his own keyboards to complete the beat. Check out the latest episode of Rhythm Roulette right now. This video & song is cool. Song is available on Cantrell’s EP entitled “Stardust 2 Angels” (out now, linked below). Check it out! 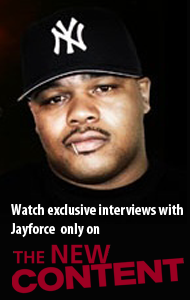 The latest addition to Mass Appeal Records’ roster, Cantrell was raised in Albany, Georgia and traces his roots to the rich Hip-Hop culture of Atlanta. He discovered jam-skating as a creative outlet and by his teenage years, he was able to turn pro as a jam skater—joining the historical breaking crew TBB. The legends, Eric B. & Rakim, give the rundown on their Top 5 Hip-Hop songs ever. 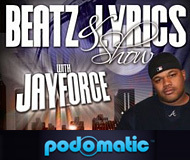 When a Top 5 emcee picks his Top 5 songs of all time you gotta wanna know the list, right? Well, here’s Nas’. Ah! A J Dilla disciple is on deck to play ‘Rhythm Roulette’ huh? This should be more than interesting! In the sit-down clip above, hear Royce Da 5’9 talk about being more ‘woke’ and aware – more about himself, his family, sobriety and really living day-to-day than about anything political. I’m more aware than I’ve ever been. All my other albums were just moments, just moments of clarity. This is album is just me dialed in, all the way through. And that’s my life, I’m dialed in 24 hours a day.